Very handsome grade II listed pub that wears its 200 years well. Shabby chic, I'd call it. Great jukebox, quality Sunday papers and tiled front bar area. Nice locals. Robinsons beers in decent condition. Worth seeking out for some old school drinking. 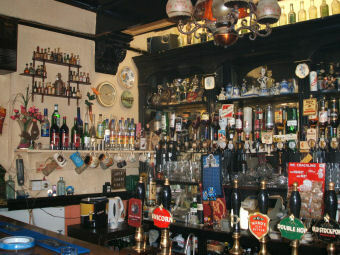 Pleasant pub with nice comfy seats. Had the "Trooper" beer which Iron Maiden got involved with making - a lovely pint. Had some good porter on amongst a good choice of beer, mostly Robinsons. 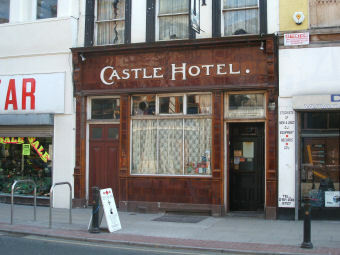 Visited the Castle a few times, always found it a decent enjoyable little place. Nice to have the full range of Robinson's as well as a selection of other brewers and bottles which you don't always find in Robinsons. It was nice to find Brooklyn Lager on tap here once, and also Goose Island 312 Urban Wheat in bottle. Every time I have been here we end up sitting upstairs as there is better seating arrangements. I've not been when there has been an event on, I can imagine what is normally a cosy little place becomes extremely cramped. I'll always have fond memories of the times I have been here. Not a pub that does its best work mid week afternoons, which is when I popped in. Pretentious, too cool, and pretty well empty, apart from the bar person & her dog. She (the young bar person, not the dog) tore herself away from her lap top to serve me a pint of something called Cumbria Way, 3.30, which was OK. I realise I was not the demographic the pub was aimed at, so drank quickly & scooted. Terrific blend of hipster hangout and traditional local with a back room for events and a splendid array of ales on tap, many of them from Robinson's. Interesting literature with an artistic bent layers the shelves while the atmosphere is convivial. If I lived here, I'd be here all the time.